Communication between the Yalantis team and our clients is transparent throughout all stages of app creation. Yalantis sends comprehensive reports of all project development activities to our clients at the completion of each iteration. To begin, let’s take a look at the reports we compose for our clients starting from the pre-production stage and going up to the time of app release. Documentation that emerges within the project planning stage is based on requirements defined in collaboration with the client. After requirements are gathered from the client, we draft an information architecture in the form of a PDF document containing a mind map, use-case diagrams, user stories, and user flow. Once these artifacts are approved, we make wireframes to arrange app’s content, interface elements, and navigation flow. Next, we produce detailed estimates enumerating all planned development activities. Our estimates includes a list of features, anticipated development time (in hours), and projected cost. The project planning stage ends with the creation of a project plan, a document that projects iterations and the estimated time for their completion. The project plan provides transparency to the production timeline and is constantly updated so that everyone involved can track progress at any time. The final project planning document - the technical requirements document - contains detailed information and technical tasks pertaining to the entirety of the app development process. 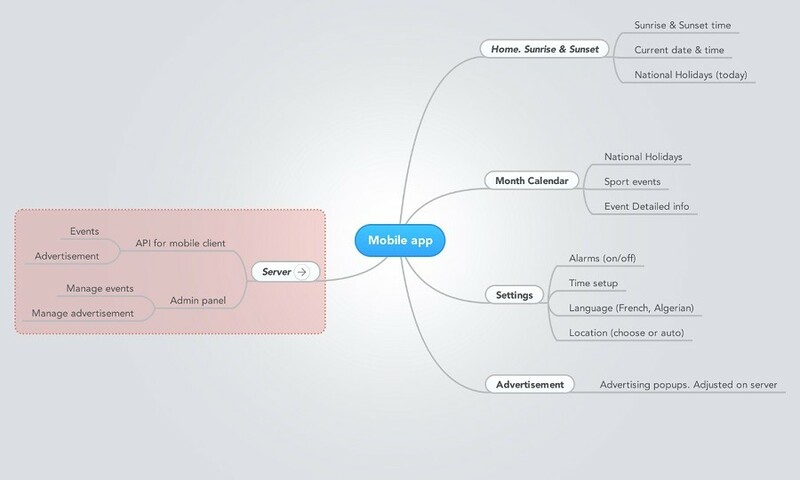 It describes the app’s functionality and includes a list of features, use cases, UI concepts, and prototype screenshots. The main purpose of this document is to make sure that the Yalantis team and the client see eye-to-eye so that no misunderstandings occur during the period of development. The whole project development process at Yalantis is divided into iterations (also called “sprints”) which usually last about two weeks. After each iteration, the project manager sends the client a report detailing the work that has been accomplished. The correlation between anticipated time required and actual time spent on completion of these activities. 2. A link to the latest build. We store the latest builds of our projects on Crashlytics Beta. 3. Information about project progress. This part of the iteration report presents a breakdown of hours for each activity within a given iteration: total estimated hours, actual hours spent, hours remaining, and saved hours or hours exceeding the initial estimate. Activities may be broken down as follows: iOS and Android development, backend, design, project management, and quality assurance. The “Change request” row on the screenshot above displays extra hours needed for the implementation of additional features that the client has requested, above and beyond the initial agreed cost estimate. Note: The content of this table can vary depending on the activities that the project requires. Also, in some cases, activities for iOS and Android platforms may be divided into separate projects. 4. Accomplished tasks and plans for the next iteration. 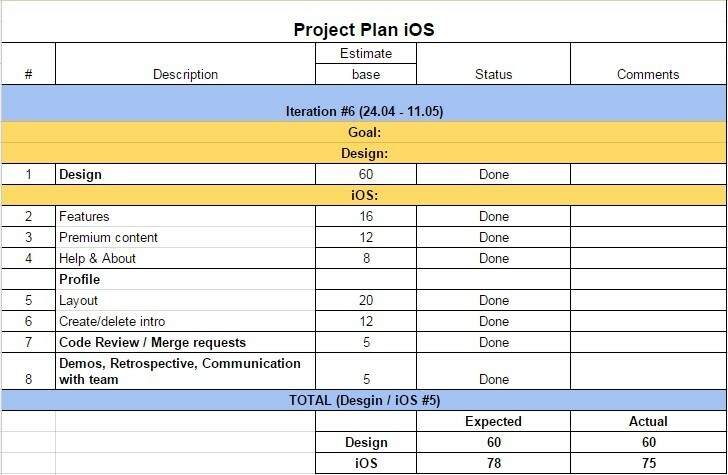 For the final component of the iteration report, the project manager creates lists of “What was done” and “Plans for the next iteration,” summing up the accomplished activities and introducing tasks for the next sprint. Each paragraph of the iteration report is supported by clarifying comments from the project manager, including thoughts on the development process. Once all iterations are finished and the project is 100% ready, the project manager sends the client a final report. 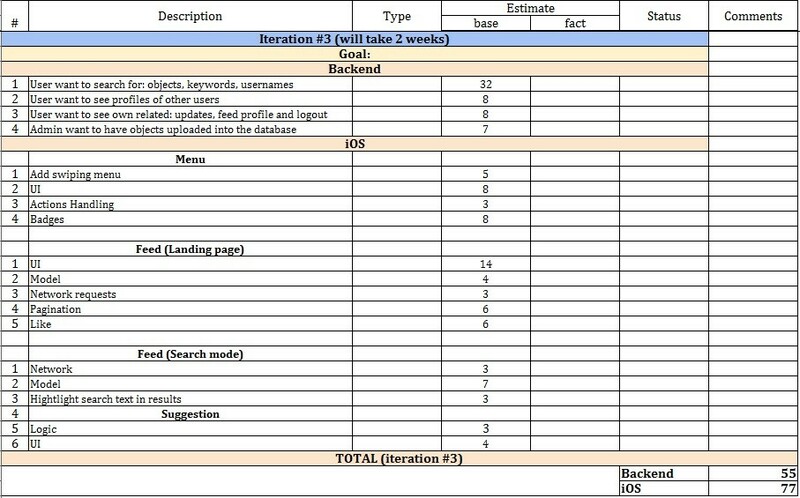 The final report consists of a project plan filled with statistics about each iteration, and a report on saved/extra time for each type of activity (iOS, Android, backend, PM, and QA). The main goal of project reports is to provide our clients with a transparent view of the entire project development progress, helping them track budget expenses, iteration timeframes, and functionality implementation. Composing reports also helps us, at Yalantis, to stay on track with development, detect issues as soon as they develop, and resolve all complications in a timely manner.